Sometimes you make rules that are rational and necessary. Like "stop sleeping with that guy," or "try to be only a half hour late to work at least a couple times a week." Right now, my rule is, "No more t-shirts." There is a t-shirt problem in my apartment. They're everywhere. In every drawer and stacked in piles in my closet. There are t-shirts in bags that I've sworn will go to good will and an even bigger pile that I have double sworn are going to be made into a quilt. I have been pretty good about no more t-shirts and added the challenge of no more tank tops to the rule. Everything was going Just.Fine. And then I stumbled on this picture. This is easily the most badass photo, possibly of all time, and I do not even care if it is photoshopped, because it is that good. 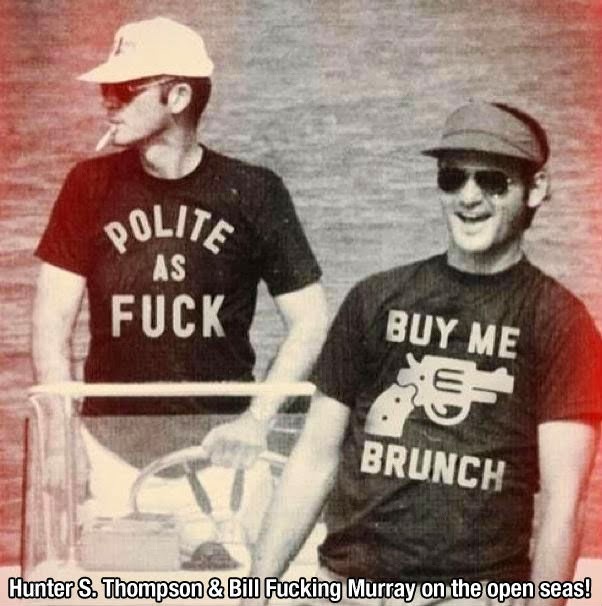 I had to go on a quest for these shirts because hot damn do I love manners and brunch. It did not take too long to find Buy Me Brunch and decide that I wanted nearly every single shirt they sell. It hurts me. It physically hurts to not already have the "Buy Me Brunch" tank on its way to my house. Every single shirt I see has people who I know need it in their lives. My brother? Absolutely needs a snuggle monster tee. Most of my friends from high school (and some of my friends from the rest of my life) need the Surprise I'm Drunk tee. If it had not literally just been Christmas about six minutes ago, and if I did not spend my life in everything except t-shirts, ugh, it would be mine. I'll see if I can wait until February before I bend because my will power is actually nothing. For those who do not make arbitrary rules, buy a shirt. Immediately.